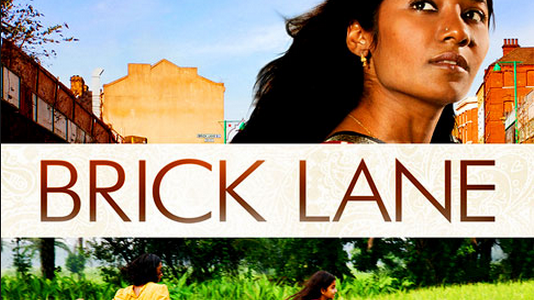 Published in 2003, Monica Ali’s wildly successful novel Brick Lane recounts the story of Nazneen, a young Bangladeshi woman who moves to London for an arranged marriage with an older man named Chanu. While Nazneen is at first too frightened by her alien surroundings to leave her cramped Brick Lane apartment, Ali’s book charts her growing physical and social mobility as she embraces her adopted home and its work ethic. 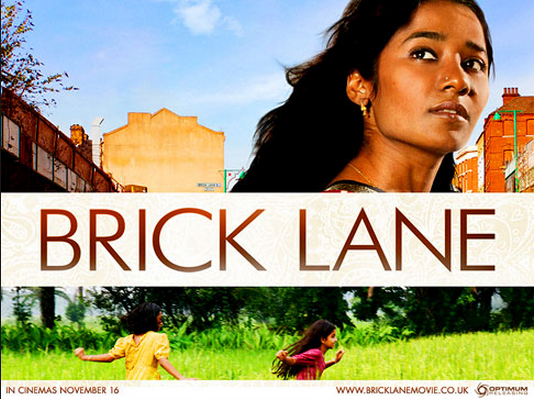 Although some members of Brick Lane’s Bangladeshi community objected to their representation in the novel (Greer), among mainstream media outlets the text received glowing reviews, particularly in terms of its apparent power to explain and define the South Asian diaspora in England in ways that non-diasporic audiences could easily understand. In the pages of reviews that precede the 2003 Black Swan edition of the text, for example, an unnamed reviewer for the New Statesman writes, “I . . . feel more informed about the people who are my next-door neighbors than I did before I read this book.” Author Margaret Forster, meanwhile, says that the work “[took her] into a life and culture [she knew] little about.” The narrative of upward mobility in Brick Lane—as chronicled through the heroine Nazneen’s progress into bourgeois subjectivity, accompanied and encouraged by her best friend and fellow Bangladeshi migrant, the fairy godmother-like Razia—suggests that the novel can be read as an allegory for the journey of the immigrant Other towards achieving conventional ideas of success, power, and social mobility. Drawing on Michaela Fay’s assertion that it “needs to be reconsidered as a multi-layered concept” (65), I will examine mobility in Brick Lane as an idea that is social, physical, and spatial in nature and argue that these mobilities are of the utmost importance thematically in Brick Lane. In many ways, Ali’s representation of upward class mobility leads the novel’s audience toward “a sense of liberation” (Cormack 707), with the reader sharing in Nazneen’s victory over her erstwhile feeling of paralysis. However, while Nazneen seems by the end of the novel to have “found herself,” at least in the sense of having entered the labor market and thus a state of bourgeois subjectivity, we must wonder what has been sacrificed in the achievement of this end, as any semblance of a strong political voice in Ali’s novel is ultimately foiled or silenced. The Bangladeshi diaspora is depicted in Brick Lane as torn between static and parochial tradition and a more “modern” hybrid and mobile dynamism. In the same vein, Vijay Mishra comments in “The Diasporic Imaginary” on some of the principal differences between what he terms the old/exclusive diaspora, “[creating] relatively self-contained ‘little Indias’ in the colonies,” and the more hybrid new/border diaspora, for which the “overriding characteristic is one of mobility” (422). Nazneen’s husband Chanu is representative of the first group, as is the Brick Lane community as it first appears in the novel. Chanu explains that the other residents of Brick Lane “all stick together because they come from the same district . . . they think they are back in the village” (Ali 28). Although Chanu is prone to hyperbole, characters like Mrs. Islam—and even Razia, at first—are decidedly uncomfortable “mixing with all sorts” (29). Socially, then, it would appear that the Brick Lane immigrants are unwilling to be mobile in the sense of moving outside their ethnic community to form relationships. Further, Chanu says, “[they] are peasants. Uneducated. Illiterate. Close-minded. Without ambition” (28). If Chanu is correct in his assessment, then the community is also not socially mobile in the sense of its participation in the labor market; without education or ambition, how is the Bangladeshi immigrant to achieve upward mobility? This attitude of passive inertia also extends to Nazneen: “nothing could be changed, everything had to be borne” (16), she thinks soon after her arrival in London in a rejection of the agency she does not initially believe she can achieve. This sense of immobility in the diasporic community extends to the spatial and physical spheres. Nazneen encounters tremendous difficulty in embracing a physical mobility outside the confines of the flat. This is a result of both her own sense of inertia and Chanu’s unwillingness to encourage her to leave their building without him; although she longs, for instance, to visit the tattoo lady, whose appearance fascinates her, she finds herself too frightened to do so (19). The diasporic Bangladeshi community of Brick Lane—and in particular, Chanu—is confined in a spatial sense to London, victims of Going Home Syndrome; as Dr. Azad comments cynically, “they will never save enough to go back . . . Every year they think, just one more year. But whatever they save, it’s never enough” (32). Trapped within a country in which they feel unable to set down roots or to be mobile in the social, physical, or spatial sense, the Bangladeshi immigrants appear to be a poor example of mobility. By the conclusion of Brick Lane, however, it becomes clear that some great change has occurred in certain members of the community. From an old-diaspora style paralysis, these characters have assumed the mobile aspect of the border diaspora—what Mishra terms “the site of hybridity, change, [and] ‘newness’” (“[B]ordering” 190). In her defeat of Mrs. Islam and refusal to return to Bangladesh, it seems we are meant to understand that Nazneen, no longer passive and fearful but confident and outspoken, has discovered her agency (Ali 16) and therefore her capacity for upward social mobility. This can especially be seen in Razia and Nazneen’s participation in “Fusion Fashions,” which as its name implies, sells a kind of sanitized hybridity wherein a white woman can wear a traditional kameez paired with a Western-style flared salwaar (394). Razia and Nazneen’s new company allows both characters greater independence, as they no longer need to rely on middlemen like Chanu or Karim for income; from anonymous migrant wives of the periphery, they have become ambitious and upwardly mobile businesswomen. Likewise, some of the children of the Brick Lane immigrants, such as Razia’s daughter Shefali, are set to attend university, thereby taking the first steps toward upward social mobility—and presumably carrying their families along with them in their ascent. Brick Lane itself appears to have undergone a symbolic transformation throughout the course of the book. By the end of the novel, the old-diaspora’s recreation of a Bangladeshi market bears a “mixed-blood vitality” (396), signaling the neighborhood’s newfound new-diaspora hybridity. Money has also begun to flow into the community, hinting strongly at the sense of upward mobility so prevalent in the text: as Chanu exclaims when he and Nazneen pass a fancy new restaurant, “All this money, money everywhere. Ten years ago there was no money here” (252-3). Cosmopolitanism requires one to have: extensive mobility, whether that is corporeal, imaginative or virtual; the means to consume en route; a curiosity; a willingness to take risks; an ability to map one’s own society; semiotic skill to interpret images of others; and an openness to other people and cultures (Szerszynski and Urry, quoted in Basi 24-5). In other words, as Alastair Cormack points out, Nazneen has grown into a person much like Monica Ali herself: “She has become a new manifestation of the sovereign bourgeois subject who could, should she so desire, write a realist novel” (713). In Brick Lane, then, we see a thematically significant transition among some of the central characters, from an insecure immobility to a confident, cosmopolitan and upwardly mobile feeling of movement and liberty. This diasporic allegory indicates that a relatively happy ending (signaled crucially by the achievement of a labor-driven mobility) is possible for the immigrant Other in her adopted country—at least for those willing to embrace this kind of cosmopolitan bourgeois subjectivity. Mobility is inevitably tied to processes of power: “Mobility and control over mobility both reflect and reinforce power. Mobility is a resource to which not everyone has an equal relationship” (Sheller 258). Monica Ali effectively demonstrates the (im)balance of mobility, agency, and power in the novel through her representation of disparities in upward social mobility; she does so, however, in a somewhat surprising way. Contrary, perhaps, to expectations that the realist Brick Lane would reflect the reality of migrant women’s frequent downward mobility and migrant men’s comparative upward mobility (Willis and Yeoh, quoted in Cresswell and Uteng 5), many of the principal male characters show little to no mobility by the denouement of the novel: Karim becomes a political leader, then fails in his mission to unite the immigrants (ironically, his efforts end in a riot that tears apart the community); Chanu, meanwhile, arrives in Britain with big dreams but leaves for Bangladesh after taking a series of increasingly humiliating jobs. In contrast, Nazneen, Razia, and Shefali, in starting a business and entering university, and accordingly participating in the market economy, seem to be on the verge of upward social mobility. Physical mobility is difficult for Chanu as well: Ali emphasizes this sense of paralysis in the text, writing that “he often spent the day prostrate on the sofa without dressing, or pinned to the floor beneath his books” (184). Chanu’s books and ideas, she indicates in this passage, prevent him from taking action by forcibly weighing him to the ground. While Karim is mobile and physical in a way that Chanu is decidedly not, I would argue that his failure to promote solidarity among the Brick Lane immigrants points ultimately to his lack of mobility and agency. To a certain extent, this gendering of mobility puts into question Bruce Robbins’ assertion in Upward Mobility and the Common Good that narratives of upward mobility “can be justly juxtaposed to ‘the common good’” (235). At least in the case of Brick Lane, the good stemming from Nazneen’s upward mobility seems to be rather more selective and gendered than it is common. As with her portrayal of Bangladeshi and British female labor, Ali’s representation of male and female mobilities does not entirely cohere with the body of research around gender, mobility, and labor. Nonetheless, there is some evidence that at least in the market for informal labor—that is, temporary or part-time labor—migrant women are indeed the preferred employees, making up two-thirds of the informal labor market work force in developed countries (Dawson 132). Several theories exist as to why this may be the case: a supply-side argument is that women’s working lives are often halted by childrearing, so employers may be unwilling to lavish time or money on their career development, thus forcing women into low-paying part-time jobs; demand-side arguments include the “radical labor market” idea that “it is of significant advantage to ‘capital’ . . . to have permanently available an unskilled, lowly paid element in the workforce” (Crompton and Sanderson 84). Women are also thought by employers to have more flexibility and adaptability than men (100)—in other words, they may be willing to put up with being treated more poorly (i.e., paid less and in worse conditions) than male employees. The characterization of Chanu in Brick Lane seems mainly to confirm, rather than undermine, these stereotypes: he turns down a job washing dishes, displaying his unwillingness to adapt to his diminished status in the racist society, and, in contrast to Nazneen and Razia, leaves England for Bangladesh rather than learn how to negotiate this society. So, in the racist country of adoption where the migrant’s only avenue for upward social mobility seems to be through low-paying unskilled labor, a female migrant may actually find more success than her male counterpart in the informal labor market. Of course, the jobs available in this market are also widely considered “women’s work,” doubly hindering the male migrant from finding a position in this market. Unfortunately, as Tina Basi argues, “The more women perform ‘women’s work’ the more invisible it becomes, and thus women become excluded from men’s conceptions of culture and history” (17). By gendering upward mobility and presenting women’s informal labor as the focus of the novel, Ali seems to render the latter more visible within the wider cultural discourse around work. In fact, this labor—arguably presented here as the only way that the migrants can achieve upward mobility—becomes, for better or worse, the crux on which the entire upward mobility narrative turns in the novel. After all, Nazneen’s garment work leads to her introduction to Karim and to her eventual financial independence in the shape of her business with Razia. Both are constructed as deeply significant events in the formation of her agency and identity and thus, in her first steps toward upward class mobility. In the upward mobility narrative, Bruce Robbins writes, an uncertainly eroticized Older Woman or donor figure, who serves as a sort of mouthpiece for the state, often appears to help the striving hero, usually a younger man, attain a higher station in the social hierarchy. 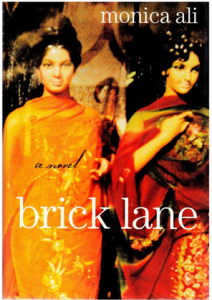 In Brick Lane, Nazneen’s friend Razia—echoing one of the central themes of the novel—constantly stresses the importance of labor and work ethic to the achievement of upward mobility. The relationship between Nazneen and Razia is interestingly similar to those found in nineteenth-century upward mobility narratives, which “specialize in ‘unnatural’ love—provisional, frustrating, often unconsummated matchups that do not aim at or end in marriage, reproduction, or heterosexual union of any sanctioned or enduring sort” (Robbins xiv). Razia, who is widowed midway through the novel, conveniently allowing her to find work against her husband’s wishes, is likewise ambiguously (or “unnaturally”) eroticized and gendered, with a “man-sized mouth” (Ali 68) and “nothing feminine about her face” (72), wearing shapeless trousers and her hair short. The relationship between her and Nazneen, in which each acts as a source of support and as a confidante for the other, is in some ways more akin to an equitable marriage or partnership than, for example, Nazneen’s foot-care routine for Chanu. Razia ultimately steps in to fill the traditionally masculine bread-winning role Chanu and Karim leave behind, functioning both as a source of money and upward mobility with the creation of their garment company: we are told that “Without Razia there would be no money at all, because Karim had disappeared . . . [Nazneen] prayed to God, but He had already given her what she needed: Razia” (484). Razia has provided Nazneen with her true entry—only hinted at earlier, with her sweatshop work for Karim’s uncle—into the world of capitalism as a competitive bourgeois laborer, and Nazneen’s gratitude takes on a near-amorous aspect in this passage. Likewise, in her Union Jack shirt and salwaar pants, Razia seems to represent the possibility of a confident fusion of British and Asian identities, endorsing the officially multicultural positions of countries like Canada and Britain. (Notably, it appears that exclusivism is incongruous with upward mobility in Brick Lane; only once Razia embraces this racial fusion—after previously, with Mrs. Islam, rejecting it —can she flourish and begin a business of her own.) Even when Razia uncharacteristically speaks against British society, saying, “Look at how much these English are paying for their kameez. And at the same time they are look down onto me. They are even happy to spit on their own flag, as long as I am inside it. What is wrong with them?” (394), it is notable that Fusion Fashions, which inspires her outrage in this scene, is later her garment-making company’s first client. Although, in her role as the voice of the multicultural nation-state, she chastises those racist British citizens reluctant to embrace multiculturalism and hybridity, she also appears unwilling to challenge the hypocrisies of a nominally multicultural Britain. Again and again, Razia upholds the importance of labor in the novel—a value that Ali also upholds in linking it so closely to upward mobility and conventional ideas of success and power. After her husband dies, one of Razia’s first statements to Nazneen is “I can get that job now” (139). Her other activities—taking English classes and re-decorating her apartment so that it “loses the feel of a settler camp” (353)—further indicate her drive toward upward mobility and some form of assimilation into British society, thus presenting an example for Nazneen to follow. This is in marked contrast to the male characters in the novel, whose focus is far less on labor than on political theory and action, which are problematically framed here as predominantly male pursuits. While Nazneen takes an interest in Karim’s group, she seems far more drawn to Karim than to his ideas, as when reading the group’s anti-imperialist newsletters becomes for her “a sweet and melancholy secret, caressing the phrase with her eyes, feeling Karim floating there, just beyond the words” (243). In contrast, Chanu, at least after he quits his job as clerk at the council, stops speaking of promotions and begins to address such varied issues as the legacy of colonialism, assimilation, and class conflict. Although these speeches are often intelligent and convincing, Ali seems to play them for laughs; when, for instance, Chanu talks about the colonial exploitation of Bengal, he is described somewhat pathetically as “[playing] to the gallery” and “rehearsing the evening’s lesson” (185-6), as if he were an actor reciting a set of lines, not a man justifiably angered by imperialism. His speeches are moreover often rewarded with boredom, in the case of Nazneen, or anger and irritation, in the case of Razia, Shahana, and Mrs. Azad. In addition, we see that the job Chanu wanted to take upon his arrival to Britain would have been in the political realm: “I had ambitions . . . I was going to join the Civil Service and become Private Secretary to the Prime Minister” (34). The mutability of Chanu’s political aspirations and beliefs, in his transition from mimic man to anti-colonial intellectual, seems to be presented counter-intuitively as evidence of the flimsiness of Chanu’s ideas rather than as the moral and intellectual progress of a thoughtful subaltern. Similarly, Karim is far more interested in social justice than in labor, often encouraging Nazeen to stop sewing in order to listen to his speeches. Unlike Chanu, whose interest in politics is of a more sedentary intellectual type, Karim is a leader and activist. Like Chanu, however, Ali indicates that Karim’s political beliefs are somewhat false and mutable, assumed and removed as easily as the “Panjabi-pyjama and a skullcap” he takes to wearing after the 9/11 terrorist attacks (376). Even the racism that Karim and his group were seemingly assembled to combat is discovered to be practically nonexistent: “They weren’t anything,” he tells Nazneen at the riot (475). It would appear that the real menace is the migrants’ political group itself, in the shape of the Bangladeshi gangs whose existence Karim had previously denied, and who ultimately take over the anti-racist march and transform it into a violent riot. Karim’s group has actually facilitated this disunity, rendering his claim of promoting a sense of unity and identity among the migrants pathetic and laughable. Interestingly, there is a sense that Chanu, Karim, and Razia are all competing for Nazneen’s affections. Certainly, Razia seems at times to wish to turn Nazneen against Chanu. When Nazneen tells Razia of Chanu’s views, Razia grumbles, “Ask him this, then. Is it better than our own country, or is it worse? If it is worse, then why is he here? If it is better, why does he complain?” (72) This is a refrain that, as spoken by upholders of the status quo, will be familiar to political activists: “If you don’t like it here, why don’t you leave?” In the case of Karim, we never see Razia at any of the political gatherings, and Nazneen is reluctant to broach the subject of her lover with her friend. Although she obviously fears Razia’s disapproval of the affair, it is notable that the women do not often discuss Karim’s group despite its importance to the Brick Lane community. In her role as the mouthpiece of the nation-state, Razia problematically denies or ignores the possibility of political thought and solidarity as an avenue toward migrant agency, instead offering labor as the sole route to mobility. In this sense, at least (and whether Ali intended this characterization or not), Razia shows the state to be politically non-inclusive, mirroring the reality in Britain: immigrants have made few inroads into the political arena as a result of the country’s strict immigration laws (Loury, Modood, and Teles 9), so they may very well have had to rely on labor and entrepreneurship to make their voices heard. Unfortunately, the informal labor in which many British women migrants have participated has been found to prevent solidarity rather than foster it (Dawson 133), thereby obviating the likelihood that this labor could function as a route to migrant agency and true upward mobility. However, because Ali rewards Razia and Nazneen, who have chosen the path of labor and capitalism, with upward mobility, and punishes Karim and Chanu with seeming failure and inertia or downward mobility, she may suggest that labor is the only avenue through which the subaltern can achieve some conventional form of success and power. in neoliberal regimes, petty capitalism and entrepreneurship are seen as a means by which immigrants can become integrated into host societies and disciplined into citizens. It is both encouraged by the state and often quickly taken up by migrants themselves . . . [U]nder neoliberalism, such strategies for promoting integration and civic participation also ultimately produce political submission and docility in the face of exploitation and lead to the erosion of the entitlements of citizenship (8). Although entrepreneurial labor is a valid way of achieving integration and attaining conventional ideas of success, it unfortunately seems to come at the expense of political participation. This is reflected in the downward mobility of the male characters, which is contrasted with the upwardly mobile female characters’ interest in labor. Furthermore, the plot of the novel, in which capitalism and the work ethic seem to be upheld, appears to be a necessary result of Ali’s use of realism and bildungsroman tropes in the text. As Alastair Cormack effectively argues in “Migration and the Politics of Narrative Form,” this “realism . . . points toward a . . . traditional Western Enlightenment argument about freedom. One may overcome the problems of postcolonial identity . . . through transcending history and achieving self-authorship” (717). By transcending the ideas surrounding colonial history—which, as I discussed previously, Ali shows by symbolically weighing down Chanu with books covering his prostrate body (184)—and by embracing a capitalistic route to mobility and freedom, Nazneen and Razia, now self-made Westernized bourgeois entrepreneurs, can, as Razia proclaims in the final line of the novel, “do whatever [they] like.” These troubling themes recall Gayatri Spivak’s warning against “theories, however subtly argued, that support the idea that upward class mobility . . . is unmediated resistance” (quoted in Robbins 238). With all political efforts in the novel doomed to failure, the bourgeois upward mobility seen in Brick Lane seems toothless and devoid of a sense of resistance, and Ali herself appears perhaps overly reliant on ideas of social mobility in the discourses of success and identity. As Cormack points out, however, there are some indications that the novel does not fit entirely comfortably within the upward-mobility paradigm. The aforementioned line that concludes the novel cannot be taken altogether seriously after all that Ali has shown us, particularly in the passages that follow the 9/11 incident; nevertheless, Cormack writes, “in terms of the trajectory of the plot, Razia’s words must be taken more or less literally” (711). The suspicion with which a thoughtful reader will greet the conclusion may, however, cast the upward-mobility narrative that precedes it in a different, bleaker light and suggests the falsity of both Razia’s statement and of an apolitical upward mobility driven solely by labor and entrepreneurship. Further, Ali’s translation of the traditional nineteenth-century upward-mobility story, which typically contains a white male hero, into a contemporary diasporic narrative with a South Asian female perspective necessarily changes and subverts the realist bildungsroman form. As Dawson tells us, all too often “[t]he experiences of women migrants are rendered invisible by dominant . . . discourses of male migrants” (127), and Ali’s project of seeking out the periphery and inserting a female perspective into the upward-mobility narrative presents a refreshing alternative to diasporic texts that otherwise silence the woman migrant. That being said, readers may finish Brick Lane wishing that, as Robbins writes, “social justice [had been] imagined as irreducible to the rewards of the work ethic” in the novel (243). The problematic implications of some of the work’s themes indicate the pervasiveness of capitalist myths of a labor-fueled rise to bourgeois success, even in texts in which one might least expect them to appear. If mobility can be defined in part as “the capacity to organize for collective action and influence institutions” (Loury, Modood, and Teles 1-2), then characters like Razia and Nazneen are, despite appearances—with their lack of a participatory political voice and their reliance on petty capitalism as a means of ascending the class hierarchy—just as powerless and immobile as Chanu or the members of Mishra’s old diaspora; they are only less aware of this failure to achieve true mobility. 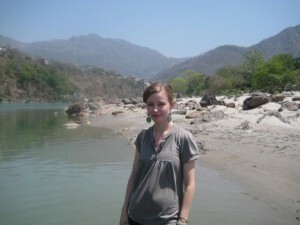 Stephanie Southmayd is a third-year doctoral student in English at the University of Toronto. Her current research interests primarily center on the intersections of globalization, nationalism, and globalized labor practices in recent Indian literature. Ali, Monica. Brick Lane. London: Black Swan, 2003. Basi, J.K. Tina. Women, Identity and India’s Call Centre Industry. London: Routledge, 2009. Cormack, Alastair. “Migration and the Politics of Narrative Form: Realism and the Postcolonial Subject in Brick Lane.” Contemporary Literature 47.4 (2006): 695-721. Cresswell, Tim and Tanu Priya Uteng. “Gendered Mobilities: Towards a Holistic Understanding.” Gendered Mobilities. Ed. Tim Cresswell and Tanu Priya Uteng. Aldershot: Ashgate Publishing Limited, 2008: 1-12. Crompton, Rosemary and Kay Sanderson. “Credentials and Careers.” The Social Mobility of Women: Beyond Male Mobility Models. Ed. Geoff Payne and Pamela Abbott. London: The Falmer Press, 1990: 83-100. Dawson, Ashley. “The People You Don’t See: Representing Informal Labour in Fortress Europe.” Ariel 40.1 (2009): 125-41. Fay, Michaela. “’Mobile Belonging’: Exploring Transnational Feminist Theory and Online Connectivity.” Gendered Mobilities. Ed. Tim Cresswell and Tanu Priya Uteng. Aldershot: Ashgate Publishing Limited, 2008: 65-82. Gardener Barber, Paula and Winnie Lem. “Introduction: Migrants, mobility, and mobilization.” Focaal: European Journal of Anthropology 51 (2008): 3-12. Greer, Germaine. “Reality Bites.” The Guardian. Guardian News and Media, 24 July 2006. Web. Retrieved 13 Jan. 2014. Loury, Glenn C., Tariq Modood and Steven M. Teles. “Introduction.” Ethnicity, Social Mobility and Public Policy. Ed. Glenn C. Loury, Tariq Modood and Steven M. Teles. Cambridge: Cambridge University Press, 2005. Mishra, Vijay. “The Diasporic Imaginary: Theorizing the Indian Diaspora.” Textual Practice 10 (1996): 421-27. —. “[B]ordering Naipaul: Indenture History and Diasporic Poetics.” Diaspora 5:2 (1996): 189-237. Robbins, Bruce. Upward Mobility and the Common Good. Princeton: Princeton University Press, 2007. Sheller, Mimi. “Gendered Mobilities: Epilogue.” Gendered Mobilities. Ed. Tim Cresswell and Tanu Priya Uteng. Aldershot: Ashgate Publishing Limited, 2008: 257-66.